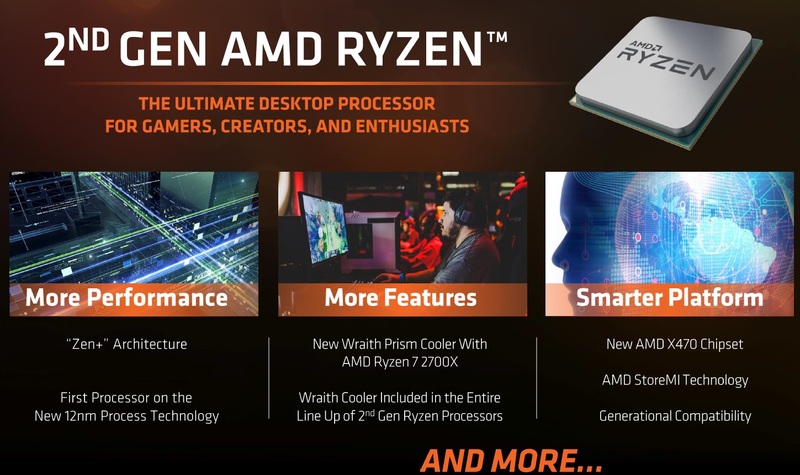 AMD is allowing retailers to begin taking pre-orders for the 2nd Generation AMD Ryzen processors known as ‘Pinnacle Ridge’ starting at 9 a.m. EDT today, which is six days before their official launch on April 19th. This new generation of Ryzen processors builds off the framework of the first generation Ryzen processors known as ‘Summit Ridge’ and offers improved performance, higher clock speeds, improved power infrastructure, an increased overclocking ceiling, faster DDR4 memory support and other small generational improvements. The key to the improvements for the 2nd Gen AMD Ryzen processors is that the core was designed on the Zen+ architecture. AMD used the 14nm manufacturing process on Summit Ridge and has moved to the more advanced 12nm process for Pinnacle Ridge. The good news for gamers and enthusiasts is that AMD is still using the socket AM4 platform, so current Ryzen owners will be able to upgrade to the 2nd Gen Ryzen processors without being required to purchase a new motherboard. The four new desktop processors that are available to order today are the AMD Ryzen 7 2700X, Ryzen 7 2700, Ryzen 5 2600X & Ryzen 5 2600. Every 2nd Gen Ryzen processor will come bundled with one of three AMD Wraith CPU cooler models. The AMD Ryzen 7 2700X 8-core, 16-thread processor is the new flagship part that has a 3.7 GHz base clock and a 4.3 GHz max boost clock for $329.00 shipped. AMD bumped up the Thermal Design Power (TDP) by 10 Watts, which makes this a 105W processor. Despite being a 105W processor it should work in all ‘old’ AMD X370 chipset boards without any issues as pretty much all of them were overbuilt. AMD includes their best Wraith Prism Cooler with RGB LED lighting that has direct contact heat-pipes for this flagship part. The Ryzen 7 2700X is a fully unlocked processor and there have been multiple leaks in recent weeks showing that can overclock up in the 4.3 to 4.4 GHz range on all cores at 1.4V with respectable cooling on the new AMD X470 chipset boards. Let’s pause for a second and talk about pricing. When AMD Ryzen 7 processors came out back in March 2017 the flagship model was the Ryzen 7 1800X and it had 8-cores, 16-threads with a base clock of 3.6GHz and a boost clock of 4.0GHz. The 1800X was a 95W TDP part and came with no CPU cooler for $499. We aren’t sure why AMD isn’t releasing a 2nd Gen Ryzen 2800X sku at the moment, but the Ryzen 7 2700X looks like it is off to a damn good start. It has a 100 MHz faster base clock, 300MHz faster max boost clock and all the generational improvements for $170 less than last years flagship models price at launch. Granted the AMD Ryzen 7 1800X is $319.00 shipped right now, but the Ryzen 7 2700X looks to be off to a great start as it prepares to do battle with the Intel Core i7-8700K ($347.89 shipped). The other 8-core, 16-thread part would be the AMD Ryzen 7 2700 processor that has a 3.2 GHz base clock and 4.1 GHz max boost clock for $299.00 shipped. This is just a 65W TDP processor that comes with the Wraith Spire CPU LED Cooler. Last year, the only Ryzen 7 processor with 8-cores that was a 65W TDP part was the Ryzen 7 1700 that launched at $329 and is now available for $264.99 shipped. This model is priced $30 less than the Ryzen 7 2700X and is fully unlocked with the same 20 MB of smart prefetch cache, so those looking for the lowest priced 8-core processor will likely flock to this model. The nice thing about fully unlocked processors is that you can manually overclock them for better performance and usually you can match or surpass the stock performance of a flagship model on a lower cost processor by doing so. AMD is also announcing two new Ryzen 5 processors today, which are the Ryzen 5 2600X and the Ryzen 5 2600. The AMD Ryzen 5 2600X 6-core, 12-thread CPU has a base clock of 3.6GHz, a 4.2GHz max boost, 19MB cache and a 95W TDP for $229.00 shipped. It comes with the Wraith Spire CPU cooler sans the RGB lighting. This part should appeal to those looking to spend under $250 and is about $15 less than the Intel Core i5-8600K 6-core processor ($242.83 shipped). This price point is widely considered a sweet spot for gamers, so it will be interesting to see some benchmarks from those two at launch. Lastly, there is the AMD Ryzen 5 2600 6-core, 12-thread processor sitting at the bottom of the stack announced today for $199.00 shipped. The Ryzen 5 2600 has the same number of cores as the Ryzen 2600X, but has lower clock speeds and comes with the Wraith Stealth CPU Cooler. The AMD Socket AM4 platform is being updated with the X470 chipset with this launch, but not much has been revealed about the platform yet. The slide above promises higher clock speeds on 2nd Gen Ryzen CPUs though and that AMD StoreMI Technology is included. This is a tiered caching system that allows users to combine different types of drives together for better performance (HDD and SSD for example). The details are minimal at best and it is our understanding that AMD StoreMI Technology is something that will likely need to be purchased. For example Enmotus FuzeDrive basic is $19.99 and is for those with up to a 128GB SSD. If you have a larger SSD you’ll need to fork over $59.99 for the solution. Update 4/13/2018 5PM CT: We just heard from Enmotus that the StoreMI that comes with the AMD 400 chipset series will be free from AMD. It someone wants to upgrade to a 1TB (Fast Tier) then they will need to contact Enmotus for the Enmotus for Ryzen Plus version. We’ll talk about that more later… The focus today is that 2nd Gen Ryzen processors can be pre-ordered today!